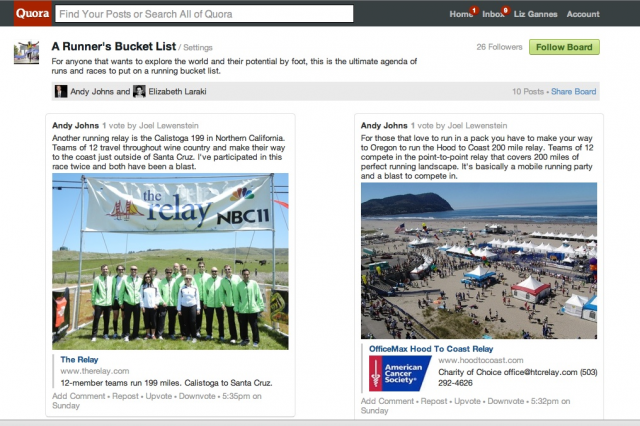 The user-generated content site Quora has become a sort of long-form writing platform, with a community standard that demands user contributions that have originality, depth and proper grammar. But that’s hard! Today, the site is launching a new product, called Boards, that lowers the burden of participation a bit. And the regular Quora tools will continue to exist, Cheever said. Boards take Quora further from the “best source” mentality of its questions and answers, and bring in a bit more personality and nuance. For instance, Cheever said, a math teacher might be interested in higher-level content than the general audience of the site, so she could create a Board of her favorite Quora content — and non-Quora content too. Quora has traditionally been highly structured and organized, with its moderators collapsing overlapping questions into each other and editing top answers into wikis. Boards, by contrast, seem like they’ll be redundant, overlapping and personalized by nature. That could be a good thing.